Modere Green Qi creates the alkaline food environment required for this to work, with only safe ingredients which is very important too. Toxins can compromise the good work of the greens, so it is important that the green drink is toxin free. We can’t just assume the ingredients are safe and toxin free these days, we have to delve deeper into each individual ingredient, where are they from, how were they grown, are they all certified organic, safe, natural, heavy metal and toxin free? One of the main reasons we chose Modere for our green drink and nutritional supplements, is that they do not compromise quality or safety. They test each ingredient of every product every batch. Because of this strict testing, there are sometimes ingredients that fail. This has happened with Modere Green Qi in the past and in December 2017. As inconvenient this may be, I am happy for the safety and standards. At Absolique we always have a back-up plan because your results are as important to us as they are to you. Synergy 100% Organic Super Greens Powder. This product is a temporary replacement for our favoured Modere Green Qi. There are only five ingredients in Super Greens as opposed to 25 ingredients in Green Qi. However Super Greens has proved to be 100% Certified Organic and will serve our purpose of creating the ‘alkaline food’ environment required for effective absorption of our recommended nutritional supplements. 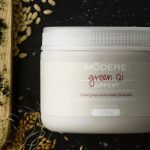 Compare Modere Green Qi and the alternative green drink Check out ingredients and directions here. As always, feel free to reach out to ask any questions about Modere Green Qi and Absolique Hair Loss Treatments or share your hair loss, hair thinning or scalp condition story. Absolique Hair Health Clinic Trichologist email info@absolique.com.au or call 07 3229 3242 to talk with our helpful reception team.